I thought about sharing some global Christmas music with you this week, but a home reorganization seems to have dissapeared the seasonally used stack. So instead of old carols gone global, you get a preview of the upcoming sophomore album from The Sway Machinery. Yeah, I know. They've got an odd name, particularly for a band doing global music. Particularly for a band whose first album Hidden Secrets Revealed consisted largely of (for want of a better term) Jewish cantorial rock. Their new songs take a completely new direction with West African vocals and rhythms, yet also sound remarkably familiar, with driving rock drumming, powerful horns, and edgy guitars. The strength of their first album helped pave the way for the band to perform at Mali's Festival in the Desert -- the first Jewish band to do so in this heavily Muslim region. When I was a boy my grandfather and I used to sit in his study listening to records of the great Cantors: Zawel Kwartin, Pierre Pinchik, Berele Chagy and other masters of Jewish music. In the dimly lit room, fragrant with pipe smoke and lined with huge volumes of the Talmud, their names resonated with a rich feeling of mythology and ancientness. On the wall was hung a framed print of a 16th century French map. In each corner of the map stood an image of one of the four races of the world, as was understood by the cartographers of the time. The images fortified the feeling that in that room the past and present and all of human kind were united in the study of some ancient wisdom. It felt to me as a child that there, in the dusky back room of my Granparents’ apartment in Queens, a passageway was opened into the heart of the world. ... Seeing turbaned men pumping their fists in the air along with my grandfather's 'Aveinu Malkeinu Z'khor' [was] certainly one of the most memorable and inspiring images from our journey. 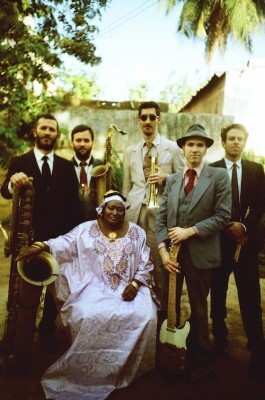 After the festival, the band traveled to Bamako, where they recorded this album and its striking inclusion of Muslim praise lyrics (as on "Gawad Teriamou"). Included are brief field-recorded interludes of women and children singing, a call to prayer, even camel songs. The albums highlights, however, are without a doubt the songs when Khaira Arby pours forth her stunning voice. Even on tracks such as "Skin to Skin" where she plays a background role, she carbonates the music's energy. This may be one small cultural-religious bridge, but it's one with an Afro-blues-rock sensibility that will appeal to listeners far outside typical "world music" circles. Now if only someone would explain to me what their name means! Oh, and during a break in writing, I found the holiday CDs hiding behind a stack of world-music compilations. So watch for some of that later this week. Happy holidays!